This order is represented in Australia by a single family, Hyriidae. Ecology: Instream habitat: Hyriidae species are widespread in lowland river systems except in ephemeral, saline or low-calcium waters. They burrow into finer sediments such as sand and mud. Some Hyriidae species can tolerate low dissolved oxygen, high temperatures and drought. 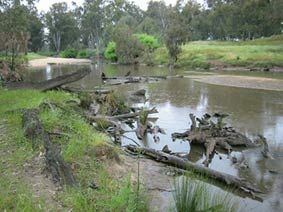 Habit: Hyriidae species use a muscular foot to drag their shell below the surface of the sediments or along the stream bed. Hyridella depressa has been recorded from burrows extending to 20 metres. Life history: Spermatogenesis generally occurs throughout the year but reduces with temperature during June and July. Intensive production of spermatozoa occurs during November until late April. Spawning occurs from late March to April. Eggs are moved into specialised portions on the inner gills (marsupia) where they develop into a hooked larval stage (glochidium). The brooding season generally extends from April to August. Mature glochidia are generally released nine weeks after spawning. 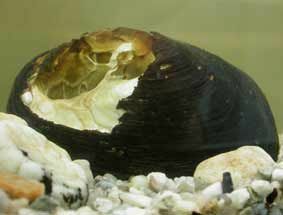 The period between August and November is a recovery period in which unspawned gametes are either reabsorbed or released. Mature glochidia spend little time in the water column, they quickly attach to the gills or fins of a fish host. The reproductive cycle of Hyridella extends throughout most of the year and it is possible that some species breed more than once per year. Hyridella depressa is a long term brooder developing glochidia in the marsupia for up to eight months. 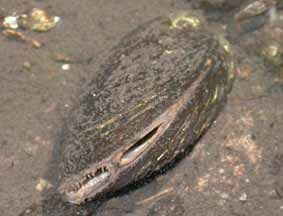 Hyriidae species are relatively long-lived among bivalves. In New Zealand, Hyridella live from 7 to 33 years. Velesunio in Australia are thought to live up to 60 years.